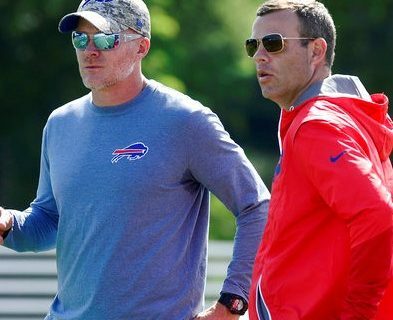 On the eve of the NFL Draft, the spotlight is on Bills General Manager Brandon Beane. He’ll be making the final decisions for the first time in his career. With nine picks, including six in the first three rounds, the pressure is one to get this draft right. Sports comedian Jeff Wozer has found signs that it’s starting to get to Beane. Here are the top signs that the Bills GM is draft obsessed. • On income tax form claimed stop watch as an entertainment expense. • At neighborhood party he traded his dog to move up six places in the food line. • Actually considered Russ Brandon’s suggestion to trade up for a punter. • Acted put-out rather than delighted when Sean McDermott arrived in the film room with just-baked Rice Krispie bars. • At recent parent teacher conference asked how his kid is doing in bench pressing. • On his job application under who to notify in case of emergency he listed Gil Brandt. 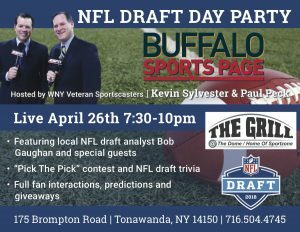 • Even listens to WGR’s Schopp & the Bulldog for draft advice. Check out more of Jeff’s humorous takes on Buffalo sports, including golfers & the Sabres.